Even when things are cold and dreary you can still catch fish. Calm sunny days offer your best chance at success. Fly fishing in winter can be challenging to say the least. Cold air and water temperatures make it uncomfortable for the angler and it slows down the metabolism of the fish making them reluctant to feed. The five tips in this post will increase your odds of success and help you catch that first bluegill of the year! In many parts of the United States pursuing panfish with a fly rod is an impossibility. 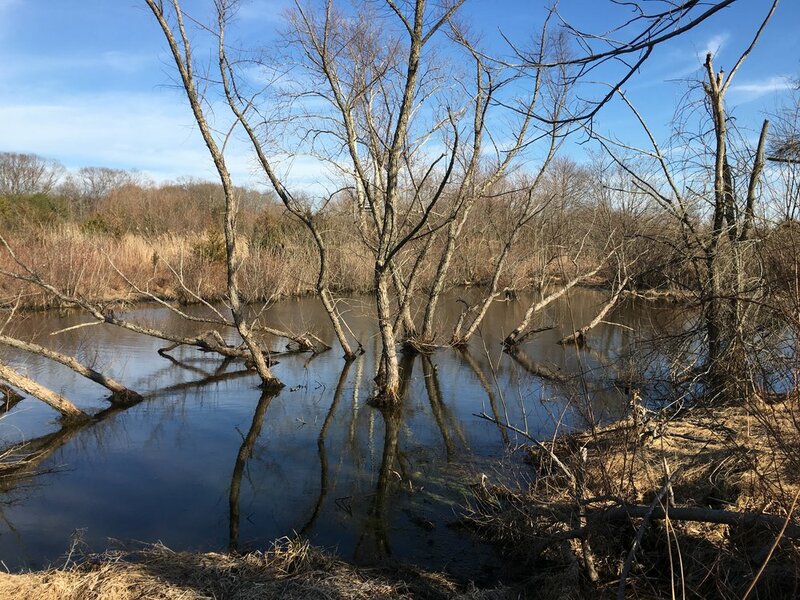 North of the Mason-Dixon Line, your favorite panfish hole may be under several inches (or feet!) of ice. Here in the northeast where I call home I usually see some open water during most winters. However, I can’t expect success unless certain conditions exist. What I look for, is a few days in a row of consistent weather. Sunny days are a plus and calm sunny days are even better. Even with air temperatures hovering around freezing bright sunshine will begin to warm shallow water especially over dark bottomed flats. Fish will take advantage of this warming water and start to move into the area. The increase in water temperature will also ramp up their metabolism a little more resulting in the fish feeding a little more than usual. Although bluegills and other panfish feed all winter long, as many an ice fisherman will tell you, cold water slows them down a bit reducing their need for food. When you fish is just as important. Fish later in the day to take full advantage of the sun’s warming effect on the water. The warmest time of the day will usually be between noon and 3 or 4pm. That is the time you should plan to be on the water. There is no need to hit the water at first light when planning a winter fishing trip! Crappies tolerate cooler water better than most panfish. Early in the year smaller flies seem to produce better than the larger streamers I’ll use later in the year. During the winter months, bluegills and other panfish tend to gather in dense schools and seek the refuge that deeper water provides. To increase your chances of catching cold weather panfish focus on smaller bodies of water. In addition to warming quicker than larger bodies of water, smaller lakes and ponds offer you the ability to reach the deeper areas with ease. In many cases, the deepwater area may be reachable with a long cast from shore. In many small watersheds, the deepest part of the lake may be right next to a dam. If there is suitable structure present, these areas may be locations were panfish are gathering during the colder months. 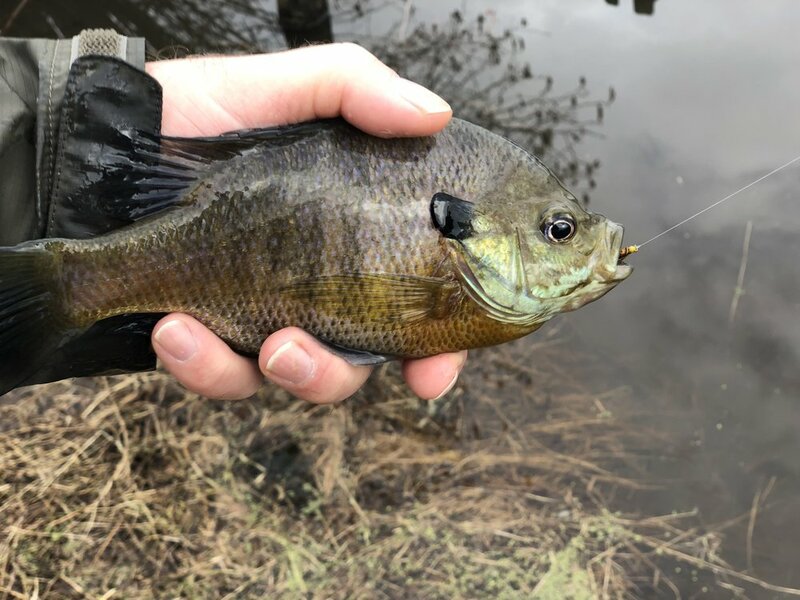 A winter bluegill caught on a nymph fished slow and deep. In addition to deep water holding areas, bluegills and other panfish will begin to enter shallow water when conditions are right. Dark-bottomed flats warm up first, and fish move into these areas temporarily. On a calm sunny day, fish will move on to these dark bottomed shallow areas to feed, retreating to the depths when conditions warrant it. Cloud cover or an advancing cold front will send these fish scurrying back to the stable conditions deep water offers. If you look closely at the water in this photograph you can see disturbances on the surface caused by fish spooked by my clumsy approach. This photograph was taken last February after a few days of consistent milder than normal weather. Often drop off areas adjacent to these flats are good areas to target, as fish will often stage there before entering the shallows. Once in the shallows, the fish will see out the warmest water. In many cases, it may be water only inches deep. A little stealth will be needed to avoid spooking the fish on your approach. In most winter conditions I tend to target deep water holding areas. I focus my efforts on smaller bodies of water like farm ponds. 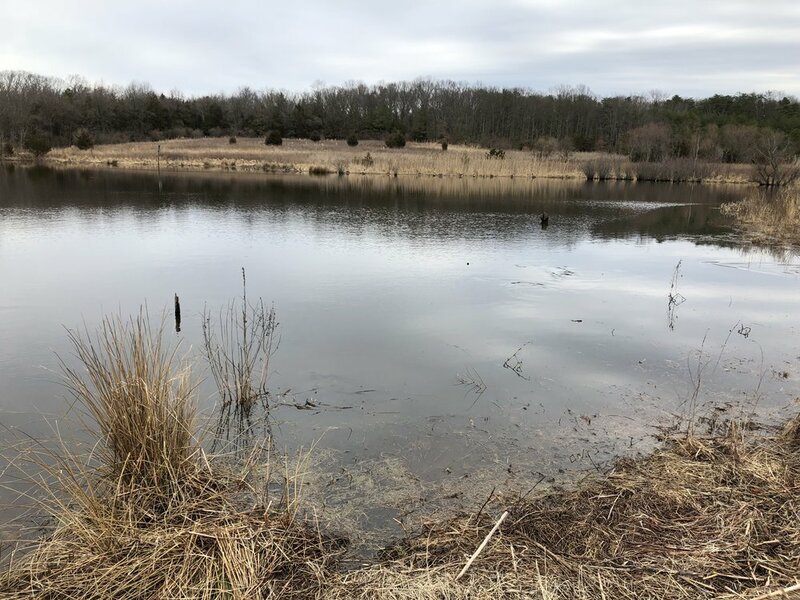 These small ponds warm up quicker than larger lakes and the deep water holding areas may only be 6 to 8 feet deep, depths that are very fishable with a fly rod. I always carry intermediate, sink tip or full sinking lines with me when fishing during the winter months. It is essential to keep your rod tip low (my rod tip is often in the water) when using sinking lines. This will allow you to have the most direct connection to your flies and it will assist in strike detection. I have found that a slow, steady hand twist retrieve the best way to present my flies when fishing with sinking lines. I want to offer the flies deep to put them in front of the fish and keep them there by using painfully slow retrieves. 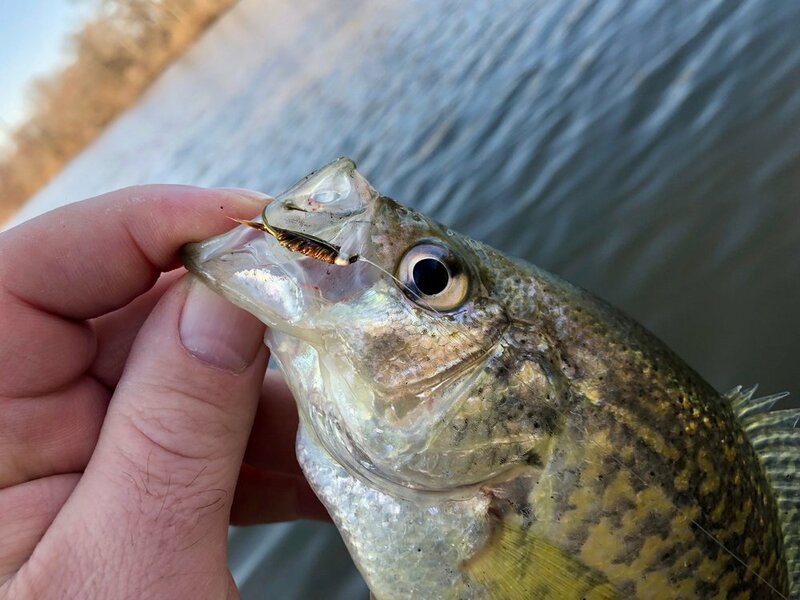 In cold water conditions, panfish will often follow a fly considerable distances before taking it. In cold water, they will not chase a fast moving fly, but a fly that is just moving slowly just off the bottom is another matter altogether. Wet flies fished on sinking or intermediate lines are my favorite way to target cold water panfish. During winter months I tend to fish soft hackles and wet flies more than any other fly patterns. These flies are usually on the small size ranging from size 12 down to 18. I prefer darker flies for my winter fishing, but I will experiment with brighter colors if my usual patterns are not working. My fishing method is very straight forward. After my cast I let the fly/flies settle to the depth I wish to fish at and with the rod top low to the surface of the water retrieve them with a slow, steady hand twist retrieve. I like to keep the flies moving slowly and steadily along the or near the bottom. If the steady retrieve is not producing results, I will introduce some pauses into the same hand twist retrieve. I seldom strip flies in cold water conditions as I feel it is moving the flies too quickly. Small flies like this size 16 olive soft hackle can be deadly on winter panfish. Don’t expect rock solid hits while fly fishing for panfish during winter months. Takes are often subtle and hard to detect. I always observe my line as these takes are often seen and not felt. Sometimes the line will just feel heavy without the usual bump or tug. When this happens, I always set the hook, and I am often rewarded with fish. Nymphs are also a great option for cold water fly fishing. You can fish them just like the wet flies and soft hackles I described above, or you can suspend them under an strike indicator. Suspending your flies near the bottom is a very effective way to catch sluggish cold water panfish. Casting a rig with a fly or two suspended 6 to 8 feet under an indicator can be a little cumbersome. If I need to fish deeper than four feet, I will often rig up the strike indicator to work as a slip float to allow me to cast easier. Nothing special in regards to flies is needed here, a hares ear or pheasant tail nymph will work as well as anything else. Again your nymphs should be on the small side. No larger than a size 12 and going down to a size 22 when fishing midge larva and pupae patterns. When fish are feeding on Chironomids (midges) they will often suspend or even feed on the surface. These insects are available 12 months out of the year and are an important food source. If I suspect that these insects are present and the fish are feeding on them, I will start out fishing on the bottom and gradually adjust the depth of the indicator until I find the exact depth where the fish are feeding. Strike detection using an indicator can be difficult when targeting panfish in cold water. Some indicators do a better job at this than others. I prefer the lightest possible strike indicator that will properly suspend my flies. My favorite strike indicators for cold water fishing are the Dave Whitlock Telstrike Indicators which have a center post that reacts to the slightest disturbance. Watch the indicator closely and set the hook at the slightest movement. Just get out there. You can’t catch a fish from your couch or the seat at your tying desk. Although I whittle away many a winter hour seated in front of my fly tying vise to ward off cabin fever, nothing cures it like getting outdoors! In my area, ice out usually occurs in early March and recent years as early as late February. Just getting out on a bright sunny day, feeling the warmth of the sun on my skin and getting some casting practice is as good as an excuse as any to get outdoors for a few hours. Nothing cures cabin fever better than putting a good bend in your rod on a winter’s day!